Please feel free to contact us with any comments. We would love to receive your interesting facts, photos or stories about any of our villages! All our properties are in the Chania region of Crete which is the segment of Crete shown on the map to the left. 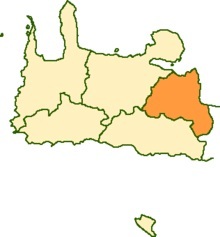 The orange part of the map is the Apokoronas ‘province’. 90% of our properties are in this region – which is East of the city of Chania. If you have time, browse through the village information that we have– there’s lots of detail to interest you and a great video of some of the sights in Chania itself (the market, the old town, the harbour). ALL of the villages where we have property are within an hours’ drive of Chania airport. Many are much less than this. Apokoronas is a beautiful area – the greenest area of Crete. There are some ‘tasteful’ tourist villages on the coast with bars and lots of great tavernas. However, 5 - 10 minutes in land you can still find many villages where tourists’ are not regularly seen. Based on our experiences in living here over the last 10 years, we can guarantee you will be made more than welcome in all these different places. The list to the right consists of links within our web site to information about the villages of Apokoronas and of course Chania itself. Click on a village name to see more information and photographs. There are also other places where we have property or where you might like to visit. There is basic information about each village along with, notes about our opinions and experiences in these places and of course lots of pictures! Please contact us if you see particular villages that you like or if you want more information about property in that village. In reality we can usually find something to your taste in most villages. Please note: If your opinions vary from ours, or if you think we might improve the information, please tell us. All feedback will be welcome – and acknowledged. In addition, if you want to send us any photos of your village or interesting stories, please do so and we’ll try to post it on the site. Melina Goustis from the Bicorna Cafe in Plaka has gathered together the history of Apokoronas. Please have a look at her website for more information.